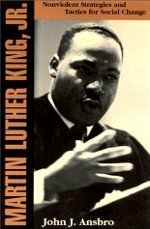 I recently finished John J. Ansbro’s book Martin Luther King, Jr.: Nonviolent Strategies and Tactics for Social Change . The fine subtitle is poorly served by its book, and better describes a book I would rather have read. That isn’t to say Ansbro’s book is bad, just that it doesn’t really go into much depth into the tactical and strategic thinking that informed King’s specific leadership decisions during his use of nonviolent political force. Instead, the book is an exploration of the intellectual sources of King’s thinking on a number of issues — both those thinkers he drew from and those he reacted against. These included folks like Harold DeWolf (personalism, theology, the church); Edgar Brightman, Peter Bertocci, and Walter Muelder (personalism); Walter Rauschenbusch (the social gospel); Karl Marx (mostly in reaction, but also in envy at his influence); Henry David Thoreau and Mohandas Gandhi as well as Socrates, Augustine, Thomas Aquinas, Richard Gregg, Frederick Douglass, and George W. Davis (civil disobedience); Reinhold Niebuhr (theology, civil disobedience); Hegel and Heraclitus (history); Nietzsche, Kierkegaard, Paul Tillich, Karl Jaspers, Jean-Paul Sartre, and Hegel (philosophy); Booker T. Washington, W.E.B. DuBois, and Stokely Carmichael (black activist strategy); and George Kelsey (racism). It tends to paraphrase some of the representative thinking of these folks, and then to compare and contrast that with what King said on the subject (or, sometimes, to present King’s explicit references to them). As such, it’s an interesting read and a good source of leads to follow, although it can be a little plodding at times and it tends to try to turn every example of King being influenced a little by thinker A and a little by thinker B without exactly adopting the ideas of either one into a grand self-consciously Hegelian synthesis instead of just the garden variety influence it appears to have been. The extent to which King had been influenced by the existentialists was new to me, and, not being much up on contemporary Christian trends, this was also my first real introduction to “personalism” (I think in my naïve mind, I thought when people talked meaningfully about a “personal God” they meant it in the same sense as a “personal parking space”). Don Timmerman explains why he and his wife didn’t pay their war taxes this year . Cashew traders in Guinea Bissau “have decided to boycott the current marketing season” — deciding to go on strike rather than pay a new export tax. The April 15 tax deadline passed last Friday , and for the 19th time the Rev. A.J. Muste’s tax return was among the missing. Since 1948 , the Internal Revenue Service has received from Mr. Muste only a Bible, a copy of Thoreau’s essay “Civil Disobedience” and a three-page typewritten outline of the principles that he feels prevent him from making a contribution to the armaments of the United States.